In late September 1990, speaking at a ceremony marking the 30th anniversary of the creation of the Committees for the Defense of the Revolution (CDRs), President Fidel Castro announced that the country had entered a “special period in time of peace.”2 He likened the prevailing economic situation—sharply reduced levels of imports of fuel, food, raw materials, machinery and spare parts—to what would have ensued from the imposition of an air and naval blockade in a war situation. Surviving this “special period in time of peace” would require emergency measures similar to those called for in a war setting. The events that triggered Cuba’s economic crisis of the 1990s are undoubtedly related to the shift in trade and economic relations with the former socialist countries that began in 1989 as these economic partners abandoned central planning and began to transition toward market economies. In the late 1980s, Eastern European countries and the former Soviet Union purchased 85 percent of Cuba’s exports, provided a like share of imports, and were the main source of the island’s development financing. The disappearance of socialist regimes in Eastern Europe and the former Soviet Union, and these countries’ demand that henceforth trade relations be conducted using convertible currencies and following normal commercial practices, meant that the economic support Cuba had received from the socialist community for nearly three decades vanished almost overnight. While external sector shocks triggered the economic crisis of the 1990s, they alone are not responsible for its occurrence, severity or length. The underlying causes of the crisis are the well-known inefficiencies of centrally planned economies, compounded by distortions created by massive inflows of resources from the socialist bloc and the obstinacy of the leadership to undertake the political and economic reforms necessary to overcome the crisis. Under the current political and economic scenario, the external sector appears unlikely to be capable of being the engine that pulls the economy out of the crisis. The purpose of the paper is to analyze Cuba’s external sector during the economic crisis, policies adopted by the government to improve its performance, results and prospects. It begins with a summary of Cuban economic performance in the 1990s. This is followed by a brief description of the external sector situation at the end of the 1980s. The next two sections look, respectively, at policies that have been implemented to address foreign sector imbalances and their results. The paper closes with some observations on the prospects for the external sector and for the Cuban economy in the next few years. In mid-1997, the U.N. Economic Commission for Latin America and the Caribbean (Comisión Económica para la América Latina y el Caribe, CEPAL) released a comprehensive study of the Cuban economy prepared with the cooperation of the Cuban government; a statistical annex to the study— reportedly based on information provided by Cuban official statistical sources—provides a great deal of economic data not published directly by the Cuban authorities.9 Using information contained in the BNC and CEPAL reports, together with fragmentary information from other sources, it is possible to gain an appreciation for the severity of the economic crisis of the 1990s. According to official statistics, GDP grew by 0.7 percent in 1994, 2.5 percent in 1995, 7.8 percent in 1996 and 2.5 percent in 1997. As has become the practice in the 1990s, Cuba has not provided detailed statistics to support the growth rates reported for 1996 or 1997. Experts on the Cuban economy have raised fundamental questions about the reliability of Cuban economic statistics for 1996 and, by extension, about those for other recent years and about the Cuban system of national accounts at large.13 Taking the official statistics at face value, the cumulative growth rate over the period 1993-97 is 14.1 percent, following a contraction of GDP of at least onethird and perhaps even one-half between 1989 and 1993. As part of a stabilization program instituted in 1993, government revenues were increased and expenditures cut, sharply reducing the government budget deficit to the pre-crisis level of about 1.0 billion pesos in 1994, 480 million pesos in 1995, and 360 million pesos in 1996;18 in 1997, the deficit climbed to about 450 million pesos.19 Meanwhile, monetary balances in the hands of the population declined to 9.9 billion pesos in 1994 and 9.3 billion pesos in 1995, rose to 9.5 billion pesos in 1996 and fell to 9.4 billion pesos in 1997. The economic crisis of the 1990s affected nearly all sectors of the economy. While overall GDP fell by 34.8 percent during 1989-93 according to official statistics, the performance of several key sectors of the economy was worse: output of the construction sector fell by 71.4 percent, agriculture by 51.9 percent, transportation by 45.8 percent, commerce by 43.0 percent, and manufacturing by 36.5 percent. The downturn of the construction industry was attributed to a sharp contraction in domestic investment and shortages of construction materials, while non-sugar agriculture was adversely affected by the lack of imported inputs (e.g., fertilizers, pesticides, spare parts for machinery) and of manpower to cultivate the land and harvest crops. Sugar production, still the mainstay of the economy and the most significant source of export revenue in the early 1990s, fell from 7.3 million tons in 1989 to 4.1 million tons in 1993, or by 43.8 percent, contributing to the decline in the manufacturing sector, while nickel production declined by 35.2 percent. Two bright spots for the Cuban economy during the gloomy 1989-93 period were the oil and tourism industries. Domestic oil production for the first time exceeded 1 million metric tons in 1993.20 Between 1989 and 1993, the number of international tourists visiting the island doubled (from 300,000 to 600,000 persons) and gross income increased more than four-fold (from 166 to 720 million pesos). Beginning in the early 1960s, and through around 1990, Cuba’s external sector was segmented into two parts: economic relations with the socialist world, conducted within the framework of the Council for Mutual Economic Assistance (CMEA), and economic relations with market economies, mainly Western European nations, Canada and Japan and some key developing countries, conducted on commercial terms. Economic relations with the socialist countries were by far the more significant quantitatively; relations with market economies, although quantitatively small, were strategically significant as they afforded Cuba the possibility to import goods and services and obtain technology not available from the socialist camp. Socialist Cuba began to publish balance of payments (BOP) statistics in the 1990s. During the 1980s, Cuba published BOP statistics for its hard currency accounts in a series of reports that were issued from 1982 forward by the Cuban National Bank to support renegotiation of the hard currency debt.25 These partial BOP statistics are of very limited value since hard currency transactions accounted for a small share of overall economic activity in Cuba during the 1980s. The lack of comprehensive BOP statistics means that there are no data on important components of the external sector, such as trade in services, transfers and capital flows. Cuba’s economic relations with the Soviet Union and the socialist countries were based on a web of bilateral agreements covering merchandise trade, payments, credits and technical assistance. During the period 1961-69 alone, Cuba concluded over 400 bilateral agreements with socialist countries. To coordinate the burgeoning economic and scientific-technical assistance relationship, several government-to-government commissions were established in the 1960s and 1970s with East Germany (in 1964), Bulgaria and Czechoslovakia (1965), Hungary (1966), Romania (1967), North Korea (1968), Poland (1969) and the Soviet Union (1970). Economic relations with the socialist countries deepened after 1972, when Cuba became a member of the CMEA, the organization that coordinated trade and economic relations among the socialist countries. The bulk of Cuba’s trade with the socialist countries was conducted through bilateral balancing agreements—tantamount to barter arrangements— in which individual transactions were made, and accounts settled, using either the currency of one of the two trading partners or “transferable rubles,” an artificial currency whose sole role was to serve as the unit of account in transactions among socialist countries. Because neither the currencies of the socialist countries nor the transferable ruble could be freely converted into “hard” currencies (e.g., dollars, Swiss francs, deutsche marks) to purchase goods and services in international markets, socialist nations endeavored to balance trade bilaterally each year. To the extent that bilateral trade was not balanced annually, the gap was covered by “soft” currency (transferable ruble) credits. In the 1960s, the Soviet Union began to purchase Cuban sugar at prices that were fixed for several years (typically five years). Because world market prices for sugar fluctuated—sometimes exceeding, but more often falling below the contracted price—the arrangement on the whole favored Cuba. In December 1972, Cuba and the Soviet Union signed two agreements that formalized a system of preferential (i.e., higher than world market) prices for Cuban sugar and nickel exports. In the aftermath of very high world market prices for sugar in 1974 and 1975, the contract price for Cuban sugar exports to the Soviet Union and other CMEA nations was renegotiated and adjusted upward. In 1975, Cuba and the Soviet Union agreed to a mechanism whereby sugar export prices were adjusted annually, above a very high floor, in proportion to changes in the prices of a basket of commodities Cuba imported from the Soviet Union. As a result of this indexing scheme, henceforth the price of Cuban sugar exports to the Soviet Union consistently exceeded the world market price by a considerable margin. Cuba also negotiated agreements with East Germany, Bulgaria, Czechoslovakia, Hungary, Poland and Romania which granted preferential prices to Cuban sugar exports. In addition, Cuba benefitted in the 1970s and first half of the 1980s from pricing arrangements in intra- CMEA trade that held down the price of oil below the world market price. Because the Soviet Union relied first on fixed prices and later on a five-year moving average of world market prices to set the price of oil it exported to its CMEA partners, world market price increases were passed on to importers— including to Cuba—with a significant time lag. These pricing schemes insulated Cuba from the sharp increases in the world market price of oil that affected importing countries throughout the 1970s and early 1980s. The moving average mechanism turned against Cuba in the second half of the 1980s as world market prices for oil fell while intra-CMEA oil prices—which reflected earlier price increases— continued to climb. Cuban trade with developed market economies and with many developing countries was conducted following common commercial practices and using hard currencies. Cuba earned hard currencies through the sale of its exports (especially sugar) and used such earnings to finance imports from hard currency areas. On occasion, Western governments, financial institutions or suppliers provided hard currency credits to Cuba to finance imports; these interest-bearing credits were repayable in hard currencies subject to a predetermined schedule. Because of currency inconvertibility, Cuba could not apply surpluses in trade with the socialist countries to offset deficits with developed market economies or to service debt with these nations. In conclusion, Cuba’s external accounts were segmented: soft currency accounts which covered most of the commercial and financial relations with the socialist nations, and hard currency accounts which applied to economic relations with the rest of the world. The soft currency accounts dominated: over the period 1978-85, for example, Cuba sold 76 percent of its exports and purchased 83 percent of its imports using soft currencies. From 1962 to 1974, Cuba’s merchandise trade turnover—the sum of merchandise exports and imports—averaged 24 percent of GSP; in 1985-89 it averaged 50 percent,26 evidencing greater openness of the economy and a greater influence of trade. Since the early 1960s, the Soviet Union and the other socialist countries accounted for the bulk of Cuba’s trade, far outstripping trade with capitalist countries and with developing countries. Over the period 1983-89, the socialist countries members of the CMEA (the Soviet Union, Bulgaria, Czechoslovakia, East Germany, Hungary, Poland and Romania) accounted on average for 82.9 percent of Cuba’s exports and absorbed 82.7 percent of Cuba’s imports; other socialist countries (China, North Korea, Vietnam, Mongolia, Yugoslavia, Albania) for 3.9 percent of exports and 3.1 percent of imports; capitalist countries for 9.3 percent of exports and 9.9 percent of imports; and developing countries for 6.8 percent of exports and 6.5 percent of imports (Table 2). Merchandise trade deficits set records in the 1980s, as Cuba’s imports rose at a much faster rate than exports. The deficit rose from 660 million pesos in 1980 to 2.0 billion in 1985; in 1989, the deficit recorded an all-time record high when it reached over 2.7 billion pesos. Table 3 shows data on merchandise exports and imports and deficits for selected years over the period 1965-89. 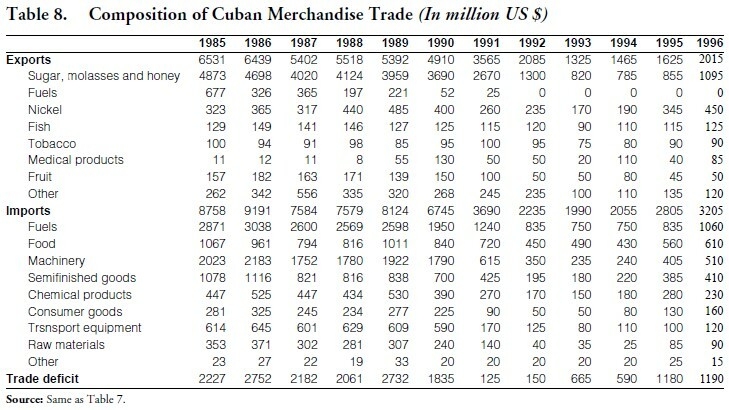 Also shown in the table are corresponding data for Cuban-Soviet bilateral trade. The two series show similar trends for growth of the deficit, with the exception of 1975, when Cuba actually recorded a positive merchandise trade balance with the Soviet Union. The percentage of the overall trade deficit incurred with the Soviet Union rose steadily in the second half of the 1980s, from about 50 percent in 1984-85 to over 80 percent in 1988- 89. These huge deficits in bilateral trade were routinely financed through transferable ruble credits issued by the Soviet Union. The large trade deficits with the Soviet Union are the more remarkable given the very favorable terms of trade for Cuba’s main exports (sugar and nickel) and imports (oil). The socialist practice of fixing commodity prices for multiyear periods (typically the five-year period covered by a plan) eliminated international commodity price fluctuations. They also resulted in transfers from one country to the other (nonrepayable subsidies) whenever intra-CMEA prices diverged from world market prices. The Soviet Union became revolutionary Cuba’s virtual sole supplier of oil and oil products in 1960, on the heels of the Cuban government’s takeover of the refineries operated by the multinational oil companies. The price of Soviet oil exports, like the prices of other basic commodities traded by the socialist countries among themselves, was fixed for a five-year period, purportedly to avoid fluctuations in capitalist world markets. Because of this arrangement, Cuba was spared the shock associated with the quadrupling of world oil market prices that occurred in 1973 and additional price increases in 1974. In 1975, however, the Soviet Union began to adjust prices of oil exports to its CMEA allies annually, based on a moving average of world market prices in the previous five years. Throughout the 1970s and early 1980s, as oil world market prices rose, Cuba benefitted from this arrangement. However, as oil world market prices fell in the mid-1980s, the arrangement worked to Cuba’s disadvantage, with the island paying prices in the late 1980s for Soviet oil that were above the world market price.29 Over the entire period 1960-90, however, the oil price supply arrangements with the Soviet Union resulted in net gains for Cuba. According to Mesa-Lago’s estimates (Table 4), the Soviet Union extended to Cuba assistance amounting to more than $65 billion during the period 1960- 90; about 67 percent of this aid was extended in the 1980s. Approximately 40 percent of the assistance (about $25.7 billion) took the form of repayable loans—credits to finance trade deficits (27 percent) and development credits (13 percent)—and about 60 percent ($39.4 billion) was in the form of nonrepayable price subsidies. In the second half of the 1980s, while the Soviet Union under Gorbachev and Eastern European countries accelerated the pace of market-oriented reforms to their economies and to their systems of foreign economic relations, Cuba was engaged in a national campaign to dismantle its few market-oriented mechanisms and enhance the role of the state in the economy through the “rectification process.” Thus, Cuba was ill prepared to react to the economic crisis of the 1990s. Moreover, the Cuban leadership was slow to react to the crisis and, when it did, it mustered mostly defensive measures. Even after the communist regime in Poland had collapsed and been replaced by Solidarity and East Germany had disappeared by virtue of its reunification with West Germany, Cuba continued to argue for maintaining the preferential trade relations it had enjoyed with CMEA nations. At the January 1990 meeting of the CMEA, the Soviet Union proposed that, effective 1 January 1991, trade among member countries be conducted on the basis of market prices and hard currencies. The Cuban representative (then-Vice President Carlos Rafael Rodríguez) took issue with the proposal, arguing that the proposed changes would (1) restore the “production anarchy” associated with markets; and (2) result in unfair terms of trade for developing countries. Rodríguez demanded the continuation of special and differential trade treatment (via preferential prices) for Mongolia, Cuba and Vietnam, so that these countries could reach the same level of development of the Soviet Union and Eastern Europe.38 Not only were Cuba’s arguments ignored, but the CMEA itself was dissolved a few months later. The Cuban leadership’s initial approach to deal with the economic crisis was reactive. In August 1990, facing a severe energy shortage prompted by a slowdown of shipments of Soviet oil, the Cuban government announced the first of several austerity measures, decreeing drastic cutbacks in energy consumption, reallocation of resources from idle sectors into agriculture and a shift to labor-intensive agricultural techniques. In September, President Castro formally announced that the “special period” had begun as shortages of imported raw materials, spare parts and foodstuffs took their toll on all areas of the economy. Cuba also attempted to negotiate follow-up trade arrangements with the former CMEA countries in order to restore basic levels of imports and sought new markets in Europe and Latin America for its exports and sources of supply for imports. In the midst of a deteriorating economic situation and uncertainty about the future of international socialism, Cuba postponed the IV Congress of the Cuban Communist Party, scheduled to be held at the end of 1990. By the time the Party met in October 1991, the international outlook had changed significantly—and for the worse—for Cuba: the international socialist community had virtually disappeared and there was no longer a socialist bloc to turn to for moral and material support. Even the fraternal and all-powerful Communist Party of the Soviet Union had ceased to exist for all practical purposes: in March 1990 it had lost its “leading role” in Soviet society and its activities had been suspended in the aftermath of the August 1991 coup. Dollarization: In the summer of 1993, Cuba decriminalized the holding and use of hard currency by Cuban citizens.46 The government also created special stores at which individuals holding hard currencies could shop for items not available to Cubans holding pesos and liberalized travel to the island by relatives and friends of Cuban citizens. The objective of these actions was to stimulate hard currency remittances from family and friends living abroad, mostly in the United States, and to provide a legal alternative to the very active black market. Convertible Peso: In December 1994, Cuba announced the creation of a new currency, the convertible peso, that would gradually replace the U.S. dollar and other foreign currencies within the island.48 The convertible peso, valued at par with the U.S. dollar, would eventually be the currency used in the tourism sector and in outlets authorized since mid- 1993 to sell goods for foreign currencies. Incentive payments to workers of certain key industries that generate hard currency—e.g., tourism, oil extraction and tobacco—would henceforth be made in convertible pesos rather than in hard currencies, as had been the practice. In September 1995, the National Assembly adopted a new foreign investment law that codified the de facto rules under which joint ventures had been operating and introduced some minor innovations to the legal framework for foreign investment.51 For example, pursuant to the new law, 100 percent foreign ownership of investments would be permitted, up from the 49 percent generally allowed by the earlier statute. The new law also simplified the process for screening incoming foreign investment, explicitly allowed foreign investments in real estate, and authorized the establishment of export processing zones. Financial Sector Reforms:54 Since 1960, when the private banks were nationalized, the Cuban National Bank (Banco Nacional de Cuba, BNC) operated as both a central bank and a commercial bank. Under a centrally planned system, the BNC’s main function was financing the implementation of the national economic plan as reflected in the national budget. In 1978, the BNC created a People’s Savings Bank (Banco Popular de Ahorro, BPA) that for the first time allowed interest-bearing savings accounts, and in 1984, an International Financing Bank (Banco Financiero Internacional, S.A., BFI) that operated solely with hard currencies; the BFI was the institution with which foreign investors interacted regarding their activities. In response to the perception by foreign investors that the financial sector was not sufficiently developed and incapable of supporting their activities, in the 1990s Cuba has taken a number of steps. In 1994, Cuba granted a license to ING Bank of Holland to operate in the island, the first foreign bank to be so permitted since 1960. In 1995, similar licenses were issued to the Société Genéralé de France and to Banco Sabadell from Spain. Other foreign banks have also been allowed to establish representative offices in Cuba. In order to expand the number of financial services available to foreign investors and semi-autonomous enterprises, the BNC created the New Banking Group (Grupo Nueva Banca, S.A., GNB), a holding company for a network of new financial institutions which include an International Bank of Commerce (Banco Internacional de Comercio, S.A., BICSA) similar to BFI, an export-import bank by the name of National Financier (Financiera Nacional, S.A., FINSA), the already-mentioned CADEDA foreign exchange houses and an Investment Bank (Banco de Inversiones, S.A.). Decentralization of Foreign Trade: Cuba has decentralized some of its foreign trade activities. Prior to the 1990s, foreign trade was a state monopoly; Cuban foreign trade institutions mirrored those of the Soviet Union and Eastern European socialist nations. Export trade was conducted by specialized enterprises of the Ministry of Foreign Trade (Ministerio del Comercio Exterior); import trade was primarily the responsibility of the State Committee on Technical- Material Supply (Comité Estatal de Abastecimiento Técnico-Material).56 Currently, organizations that produce goods and services are also permitted to import and export, with many working on the basis of hard-currency self-financing schemes. How has the external sector performed during the economic crisis of the 1990s? Have the policy initiatives of the Cuban government—described in the previous section—been successful in improving the unbalances that characterized the external sector in the 1980s? As mentioned above, Cuba published statistics for the hard currency portion of the BOP in the 1980s, but did not publish overall BOP statistics. The shift in Cuban external economic relations in the 1990s did away with the dichotomy in external accounts, eliminating the soft currency accounts. The BNC has recently published BOP statistics (in pesos, at the official rate of 1 peso=$1 U.S dollar) for 1993-95 that purport to cover all external economic relations (Table 5); CEPAL has done the same (in U.S. dollars) for each of the years during the period 1989-96 (Table 6).62 The review of the performance of the external sector in the 1990s in this section of the paper relies heavily on these two series of BOP statistics. Prior to the changes in international economic relations that occurred in the 1990s, Cuba routinely ran a very large merchandise trade deficit, financed mainly by bilateral credits from the Soviet Union. The disappearance of the Soviet Union as a source of trade financing meant that Cuba had to reduce its imports drastically in order to bring them closer to exports. Absent financing from the former Soviet Union, the trade deficit fell sharply in 1992, to $535 million, but grew thereafter to $900 million in 1993, $800 million in 1994, $1.3 billion in 1995, $1.7 billion in 1996, and nearly $2.5 billion in 1997. Disaggregated merchandise trade statistics—either by country or by commodity—are not available from official sources. Using statistics published by partner countries, the U.S. Central Intelligence Agency (CIA) has constructed Cuban merchandise trade accounts by country and commodity for the period 1985-96.64 These estimates are the foundation for the discussion that follows. Merchandise trade by country: Table 7 shows Cuba’s top ten destinations of merchandise exports and sources of merchandise imports in 1996. Interestingly, Russia tops the list of destinations of Cuban exports and occupies the same position with regard to sources of imports. With the exception of Canada, China and Japan, the remaining six top destinations of Cuban exports in 1996 were Western European nations: Netherlands, Spain, France, Italy, the United Kingdom and Germany. As a group, the top ten destinations accounted for 75.4 percent of Cuba’s total exports in 1996; for previous years, these countries accounted for between 64 and 73 percent of exports. Spain and Russia shipped about the same value of merchandise to Cuba in 1996. Rounding up the list of top ten suppliers to Cuba in 1996 were Canada, Mexico and Argentina in the Americas; China; and four Western European countries: France, Italy, Germany and Netherlands. The top ten Cuban suppliers in 1996 accounted for 65.7 percent of imports in that year, 63.1 percent in 1995 and 66.9 percent in 1994. • Fuel exports, which were a significant source of exports in the mid-1980s, disappeared altogether by the end of the decade; this is not surprising since these were actually reexports of Soviet oil sold by Cuba in the world market in order to obtain hard currency. • Sugar and related products remained as the most significant hard currency earner. Even in the 1990s, when Soviet price subsidies no longer existed, sugar and associated products accounted for over 50 percent of the value of Cuban merchandise exports in every year. • After slumping in the early 1990s, nickel exports recovered in 1995-96, contributing about onefifth of total export revenue in these years. • Exports of medical products—a proxy for exports of products of the biotechnology industry—performed erratically. Starting from a very low level in the mid-1980s, they peaked at $130 million in 1990, fell to $20 million by 1993, recovered in 1994 to $110 million, and fell again in the next two years. • Exports of fruits—an indicator of the performance of the food program—also behaved erratically in the 1990s, failing to reach the levels recorded in the mid-1980s and falling from $100 million in 1990 to about half that amount during 1991-96. Throughout the 1990s, fuels continued to be the most significant import category, accounting for 33-35 percent of the total value of merchandise imports. Meanwhile, imports of machinery, semifinished goods, raw materials and consumer goods were slashed: in 1993, imports of machinery amounted to 13 percent of their level in 1989, raw materials to 15 percent, consumer goods to 22 percent and semifinished goods to 26 percent. In 1995-96, imports in all four of these categories rose, contributing to the doubling the trade deficit that occurred between 1994 and 1995. Key export and import commodities: Tables 9-11 present statistics on the value of Cuban exports or imports to the leading purchasers or sellers of sugar, nickel and fuels. With regard to sugar exports (Table 9), the top ten destinations listed in the table accounted for about 85 percent of the value of sugar exports in 1995-96. 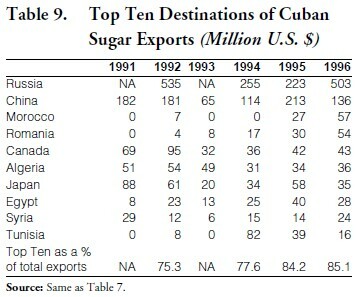 Russia remained the top importer of Cuban sugar, accounting for 46 percent of the value of exports in 1996. Middle Eastern countries were also significant purchasers of Cuban sugar. 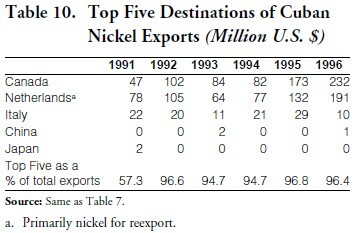 Exports of nickel (Table 10) were very heavily concentrated in two countries: Canada and the Netherlands. 65 In 1996, Canada alone absorbed 52 percent of Cuban nickel exports by value, and the Netherlands 42 percent. Exports to Canada were almost entirely comprised of intermediate products (nickel-cobalt sulfide) for further refining, while exports to the Netherlands were predominantly charge nickel (nickel- cobalt oxide and nickel-cobalt sinter). 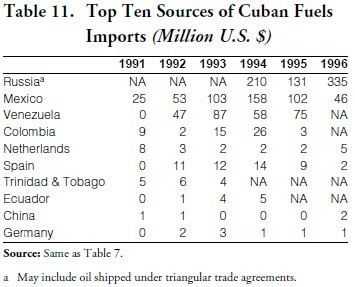 Russia topped Cuba’s suppliers of fuels in 1996 (Table 11), providing about 32 percent of the value of such imports. Several Latin American countries— Mexico, Venezuela, Colombia and Ecuador— provided significant amounts of fuels in some years during the early 1990s, but sales from these countries fluctuated severely from year to year. 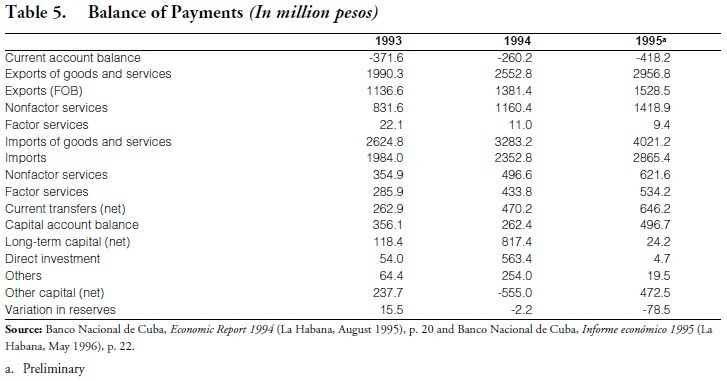 Cuba recorded surpluses in services trade in every year in 1989-96, with the exception of 1990 (Table 6). There is no additional information on specific traded services, but presumably the favorable balance in the services export account reflects the performance of the tourism industry. As is discussed below, foreign investment has played an important role in the development of this industry. With regard to efficiency indicators, the occupancy rate of hotel rooms was nearly 70 percent in 1991; it fell to about 60 percent in subsequent years. The average length of stay was 8.7 days in 1990-91, rose to 9.6 days in 1993, and then fell to 9.1 days in 1994, 8.7 days in 1995 and 7.3 days in 1996. Income generated by tourism rose by 467 percent between 1990 and 1996; it first exceeded the $1 billion mark in 1995 and reached nearly $1.4 billion in 1996. It reportedly rose by 12 percent in 1997.67 A comparison of tourism income (Table 12) and revenues generated by sugar and nickel exports (Table 8) shows that tourism surpassed nickel to become the second largest source of revenue in 1991 and overtook sugar exports in 1994. In the BOP methodology, unrequited transfers are defined as “transactions stemming from the noncommercial considerations, such as family ties or legal obligations, that induce a producer or owner of real resources and financial items to part with them without any return in those same forms.”74 That is, they represent flows of resources from one economy to another for which there is no quid pro quo. Unrequited transfers could be of an official nature (e.g., foreign grants or aid-in-kind for which no repayment is required) or of a private nature (e.g., remittances from persons who have migrated to relatives or friends who have remained at home) either in cash or in the form of goods. • The official World Wide Web page of the Government of Cuba, www.cubaweb.cu, prominently advertises “Quick Cash,” a service provided by Canadian firm Careebe Consolidated Management and Cuban entity American International Service, S.A., whereby remittances can be sent to Cuba by charging the amount on-line to either a VISA or MasterCharge credit card. The service claims delivery within to 5 working days at a banking institution in Cuba; nearly 130 outlets (primarily offices of the Banco Popular de Ahorro) located in all 14 provinces and the Isle of Youth can receive the transfers and make them available to recipients. The advertisement states that the transfers comply with all Cuban laws and, to conform with U.S. laws, must be made in Canadian dollars (although the sender may pay for the transfers in U.S. dollars). The current account records transactions between residents and foreigners such as two-way flows of merchandise and services and transfers. A surplus in the current account generally denotes that a country is gaining net claims on the rest of the world. Conversely, current account deficits are associated with insufficient domestic savings relative to investment and the net inflow of foreign capital. Neither the level of the current account nor its direction (credit or deficit) are important in and of themselves. Developing countries generally experience current account deficits financed by inflows of foreign savings (in the form of foreign investment and loans). However, persistent and escalating current account deficits may indicate structural problems in the external sector. Data in Tables 5 and 6 show that Cuba’s current account was in a deficit position throughout the period 1989-96. The deficit was very large during 1989-91, a period when the Soviet Union was still financing the bulk of Cuba’s trade deficit and offering other forms of assistance. With the disappearance of special economic relations with the Soviet Union, beginning in 1992 Cuba was forced to limit imports to what it could finance through exports and the current account deficit fell to $242 million in 1994; in 1995- 96, the current account deficit grew to about twice as high as in 1994. Cuba has released publicly so very little information on its capital account that analysis is tantamount to a guessing game. The BOP statistics provided by the Cuban government to CEPAL (Table 6) group together all elements of the capital account into a single datum; the statistics released in the Cuban National Bank reports (Table 5) are somewhat more revealing in that they break out direct investment and (presumably) long- and short-term loans, but these data are only available for 1993-95. As was discussed above, Cuba suspended service on its hard currency debt effective on July 1, 1986. While this action had a favorable impact on the BOP—since debt service payments were mooted— it seriously impaired Cuba’s ability to turn to foreign markets to obtain new financing. As a result, since the mid-1980s, Cuba has had to rely primarily on short-term loans at very high interest rates.81 According to BOP data in Table 5, Cuba had inflows of long-term loans of $64 million in 1993, $254 million in 1994 and $20 million in 1995, while short term loans were $238 million in 1993, outflows of $555 million in 1994 and loans of $473 million in 1995. BOP statistics (Table 5) report that direct investment in the island amounted to $54 million in 1993, $564 million in 1994 and under $5 million in 1995. These data are significant for at least two reasons: (1) they are the first official statistics on actual investment flows reported by the Cuban government; and (2) they suggest lower investment flows than have been reported by Cuban officials and in Cuban investment promotion literature. The foreign investment decision is a complex one, with investors considering a variety of factors, economic and political. In the case of investment in Cuba, investors face significant economic and political obstacles. Among the economic obstacles are the poor condition of the economy and infrastructure and the lack of institutions to support foreign investment; a positive economic factor might be the aboveaverage quality of human resources in Cuba. The numerous political obstacles include the statist outlook of the Cuban government, the discriminatory treatment accorded foreign investors, and uncertainty associated with government assurances regarding the sanctity of investments, the likelihood of changes in economic policy, the risk of sanctions by the United States and the possibility of expropriation by a future Cuban government. Cuban officials have justified the secrecy with which they treat investment data on concerns about possible action by the United States Government against potential or actual investors. The rationale behind the policy of “minimum reporting,” as articulated by Vice President Carlos Lage, is “the pressure which everyone who comes to invest in Cuba is subjected by the United States.”83 While this may be so, the lack of transparency in reporting foreign investment information may also be a deliberate ploy by Cuban officials to influence the investment climate by giving the impression that larger investments have occurred, or are under negotiation, than is actually the case. Flows of foreign investment reported by Cuban officials appear too high in the light of other information and the BOP data mentioned above. For example, in October 1991, Julio García Oliveras, chairman of the Cuban Chamber of Commerce, reported that negotiations were ongoing with investors representing investments of $1.2 billion.84 Vice President Carlos Lage stated in November 1994 that by the end of 1994, joint ventures would have provided Cuba with $1.5 billion in investments.85 By the end of 1995, according to official sources, foreign investment had reached more than $2.1 billion.86 There are good reasons to believe that the estimates of foreign investment provided by official sources overstate actual equity capital flows into the island: (1) multi-year disbursements may be involved; (2) some investments may be contingent on performance; (3) some investments may take the form of assets rather than cash; (4) some of the investments may be management contracts, production partnership agreements (particularly in mining and oil exploration) or debtequity swaps, where funds invested are minimal; and (5) others may actually be supplier contracts rather than equity investments.87 At best, the figures reported by Cuban government officials might represent intentions of foreign investors, but they significantly overstate—by a factor of 3 or even higher—actual capital that has flowed into the island. The U.S.-Cuba Trade and Economic Council (USTEC), an organization with collaborative relations with Cuban government entities—the Chamber of Commerce of the Republic of Cuba, the Cuban Ministries of Foreign Trade, Foreign Investment and Economic Cooperation, Tourism, Public Health, Steel-Mechanical and Electronic Industry and Foreign Affairs and the National Assembly of People’s Power88—has compiled statistics on foreign investment in Cuba from a variety of sources, including discussions with individual company representatives and government officials in Cuba and abroad. The latest such compilation (Table 14), covering the period from 1990 to May 1998, lends credence to the cleavage between investment intentions and realizations. Thus, according to USTEC, while investments amounting to nearly $5.6 billion had been “announced” through May 1998, the volume “committed/ delivered” was a more modest $1.8 billion, or 31.2 percent of the announced amount. 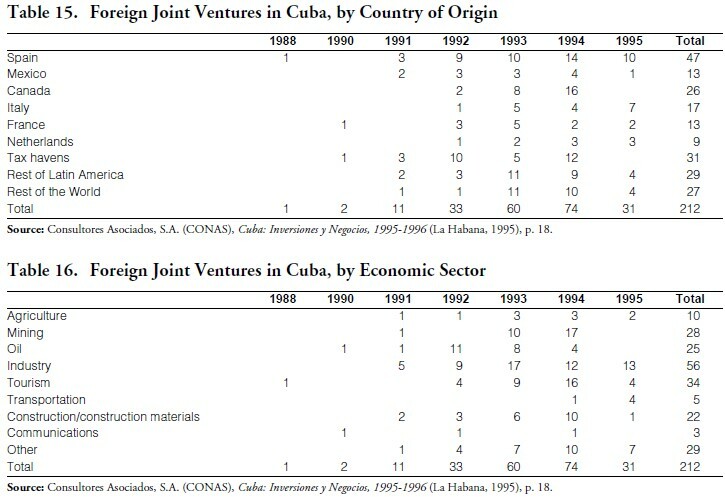 Table 15 shows the number of foreign joint ventures established in Cuba in each of the years 1988-95. As was discussed earlier, Cuba was unsuccessful in attracting investment during the 1980s despite the passage of the legal framework for foreign joint ventures in 1982. This is reflected in Table 15, which shows that only one joint venture was established in 1988 and 2 in 1990. Foreign investment activity picked up in 1992-94, with 33 joint ventures established in 1992, 60 in 1993 and 74 in 1994, but slowed in 1995, when only 31 joint ventures were created. In all, Cuban government statistics indicate that 212 joint ventures with foreign investors had been established through the end of 1995; Spanish investors were responsible for the largest number of joint ventures (47 or 22 percent) followed by Canada (26 or 12 percent), Italy (17 or 8 percent) and France and Mexico (13 or 6 percent each) (Table 15). The largest concentration of joint ventures was in the industrial sector (56 or 26 percent), followed by tourism (34 or 16 percent), mining (28 or 13 percent) and the oil sector (25 or 12 percent) (Table 16). The economic crisis that has enveloped Cuba during the 1990s has affected every aspect of Cuban society. The standard of living of the Cuban population has dropped significantly and even their access to public services has been curtailed. The bottom of the crisis seems to have been reached in 1994. Modest growth since then has made a very small contribution to the average Cuban’s standard of living but has stabilized the domestic political situation. The external sector of the Cuban economy was heavily unbalanced during the 1980s. Despite very large price subsidies and other aid from the Soviet Union and the socialist countries, Cuba routinely incurred very large trade deficits, which were financed by these same nations. The Cuban merchandise export basket remained composed primarily of traditional products and concentrated in a few markets. Cuba imported nearly all the oil it demanded and also imported significant quantities of food despite being an exceptionally well-endowed agricultural country. The economic crisis of the 1990s manifested itself through the external sector. Cuba was forced to adjust import levels to match—more or less—what it could afford to pay for through exports. This meant drastic cutbacks in imports across the board, sharp reductions in economic activity, idled workers, and inability to provide basic services (such as transportation) to the population. The initial response from the Cuban leadership was “special period” austerity. Economic reforms implemented during the summer of 1993 and 1994 and subsequently in very small doses, have been quite successful at macro stabilization, but less so at promoting economic growth. This is not surprising since the Cuban government has been reluctant to make meaningful changes (for example, enterprise reform, privatization, permitting the creation of factor markets) in order to avoid losing political control. Some of the policy initiatives taken in the 1990s have had a salutary effect on the external sector, particularly those that have stimulated tourism, foreign investment and remittances from abroad. The disappearance of the soft currency accounts— and the myriad special conditions and quid pro quos they entailed—will make it easier in the future to analyze the structure and performance of the Cuban external sector once the adequate statistical information is made available. At the present time, only minimal information is available, and its reliability is untested. 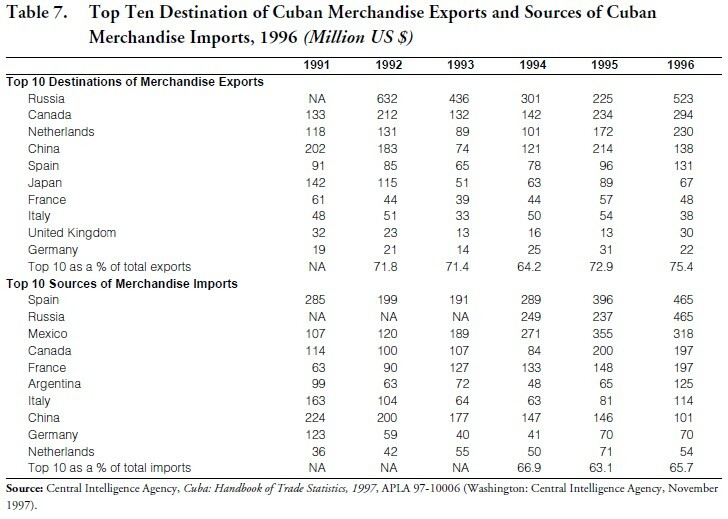 In 1995 and 1996, the merchandise trade deficit rose significantly, as Cuba began to increase imports— particularly of raw materials, semimanufactured products and machinery, which had been severely cut back in earlier years and virtually shot down significant portions of the productive sector—in the expectation that exports would also rise. The disappointing performance of the sugar sector and of the food program thwarted the expected recovery of exports. In 1997, exports rose only by 0.6 percent, while imports grew by 19.9 percent, resulting in a marked widening of the trade deficit. Economic growth in 1997 has been reported officially as 2.5 percent, about half the 5 percent rate of growth predicted at the beginning of the year. For 1998, Minister of the Economy and Planning José Luis Rodríguez has predicted a growth rate of 2.5 to 3.5 percent and a zafra of under 4 million tons of sugar, lower than the 4.25 million tons reached in 1997; the prospects for 1998 thus are modest economic growth, a smaller sugar crop and continuation of austerity measures.99 Early results of the 1998 zafra suggest that sugar production may be around, or even below, the 3 million ton mark, which would represent the lowest sugar output in 50 years.100 Under this scenario, it is difficult to be optimistic about the external sector. It is likely to perform as it has in the most recent years, providing enough foreign resources for the economy to continue to operate at very low levels of capacity and efficiency but not incapable of pulling the economy out of its depressed state. 1. An earlier version of this paper was presented at the Workshop on U.S.-Latin American Economic Relations, Institute of Latin American Studies, University of London. The paper expresses exclusively the personal views of the author. 2. Fidel Castro, “Speech during the ceremony marking the 30th Anniversary of the Committees for the Defense of the Revolution, on 28 September 1990,” in FBIS-LAT-90-190 (1 October 1990), p. 5. 3. “Estamos aún en ‘período especial,’ dice Ministro,” El Nuevo Herald (25 April 1997), 6A. 4. Comité Estatal de Estadísticas, Anuario Estadístico de Cuba 1989 (La Habana, 1991). 5. Banco Nacional de Cuba, Economic Report 1994 (La Habana: Banco Nacional de Cuba, August 1995). 6. Banco Nacional de Cuba, Economic Report 1995 (La Habana: Banco Nacional de Cuba, May 1996). 7. Beginning in the early 1960s and through about 1992, Cuban economic statistics followed the Material Product System (MPS) of National Accounts, the economic accounting system used by countries with centrally planned economies. With the disappearance of socialist, centrally planned regimes, the MPS has become disused and most countries of the world—including Cuba—have turned to the System of National Accounts (SNA), the economic accounting system used by market economies. The Global Social Product (GSP) is the broadest measure of an economy’s output under the MPS; the corresponding measures under the SNA are Gross National Product (GNP) or Gross Domestic Product (GDP). GSP and GNP/GDP are not comparable. GSP consists of the value of goods and “material” services generated by the productive sphere of the economy in a given time frame. Moreover, GSP is a gross output concept, subject to double-counting because the cost of inputs is not deducted from final output, as is done in GNP/GDP. Also unlike GNP/GDP, GSP does not include the value of production of “nonmaterial” services such as education, housing, health services, culture and art, and defense and administration. For additional information on the two national product accounting system see Carmelo Mesa-Lago and Jorge Pérez-López, A Study of Cuba’s Material Product System, Its Conversion to the System of National Accounts, and Estimation of Gross Domestic Product per Capita and Growth Rates, Staff Working Paper 770 (Washington: World Bank, 1985), Appendix A. 8. Ministerio de Economía y Planificación, Cuba: Informe económico, año 1997, undated. 9. Comisión Económica para América Latina y el Caribe, La economía cubana: Reformas estructurales y desempeño en los noventa (México: Fondo de Cultura Económica, 1997). 10. The GDP series published in CEPAL, La economía cubana, p. 352, yields a decline in GDP during 1989-93 of 31.6 percent. 11. Ariel Terrero, “Tendencias de un ajuste,” Bohemia (28 October 1994). According to this source, GDP in 1993 was 10 billion pesos, 48 percent lower than the 19.3 billion pesos recorded in 1989. 12. For example, Cuban economist Carranza estimated that GSP fell by 3.6 percent in 1990, 24 percent in 1991, and 15 percent in 1992, for a cumulative decline of about 38 percent over the three-year period 1989-92. See Julio Carranza, “Cuba: Los retos de la economía,” Cuadernos de Nuestra América 9:19 (July-December 1992), p. 142. Relying on different sources of information, Pastor and Zimbalist have estimated that GDP fell in 1990 by 3.1 percent, in 1991 by 25.0 percent, in 1992 by 14 percent, and in 1993 by 20 percent, for a cumulative fall over the four-year period 1989-93 of 50.2 percent. See Manuel Pastor and Andrew Zimbalist, “Waiting for Change: Adjustment and Reform in Cuba,” World Development 23:5 (May 1995), p. 708. 13. See, e.g., Marta Beatriz Roque Cabello and Arnaldo Ramos Lauzurique, “PIB (Producto Interno Bruto),” in Documentos del Instituto de Economistas Independientes (Miami: Cuban Studies Association, 1997), pp. 1-5; and Carmelo Mesa-Lago, ¿Recuperación económica en Cuba?,” Encuentro de la Cultura Cubana, no. 3 (Winter 1996/97), pp. 54-61. 14. The “rectification process” (proceso de rectificación de errores y tendencias negativas) was an ideological campaign launched by President Castro in mid-1986 which resulted in the elimination of incipient market-oriented mechanisms (e.g., farmers’ free markets) and greater centralization of economic decisionmaking in the hands of the state. See, e.g., Carmelo Mesa-Lago, “Cuba’s Economic Counterreform (rectificación): Causes, Policies and Effects,” Journal of Communist Studies 5:4 (December 1989); Jorge F. Pérez-López, “Rectification at Three: Impact on the Cuban Economy,” Studies in Comparative International Development 25 (Fall 1990); and Pérez-López, “The Cuban Economy: Rectification in a Changing World,” Cambridge Journal of Economics 16:1 (March 1992). 15. Calculated from Cuban official statistics in Anuario Estadístico de Cuba 1989, p. 85. Growth rates calculated on the basis of GSP at constant prices of 1981. 16. Banco Nacional de Cuba, Economic Report 1994, p. 16. 17. Banco Nacional de Cuba, Economic Report 1994, p. 14. 18. CEPAL, La economía cubana, Table A-9. 19. Cuba: Informe económico, año 1997, p. 7. 20. Banco Nacional de Cuba, Economic Report 1994, p. 8. Despite this increase, domestically-produced oil still accounted for less than one-fifth of the depressed oil consumption level of about 5 million metric tons. Apparent consumption of oil and oil products was in the range of 10-12 million metric tons per annum in the late 1980s. See Jorge F. Pérez-López, “Cuba’s Transition to Market-Based Energy Prices,” The Energy Journal 13:4 (1992). 21. For example, detailed physical output data, product prices adjusted for inflation, relative importance of each product within a sector and within the economy at large, methodology for incorporating non-state sector activities into national product aggregates are not available. 22. “Zafra de Cuba es la más baja en 50 años, según cifra oficial,” El Nuevo Herald (19 June 1995), p. 1B. 23. Cuba: Informe económico, año 1997, p. 2. 24. This section of the paper draws liberally from Jorge F. Pérez-López, “Cuba’s Foreign Economic Relationships,” pp. 311-352 in Georges Fauriol and Eva Loser, editors, Cuba: The International Dimension (New Brunswick: Transaction Publishers 1990). 25. Banco Nacional de Cuba, Economic Report (La Habana, February 1982) and similar reports issued in March 1984 and February 1985. Beginning in December 1982 and lasting through about mid-1990, the BNC also issued a Quarterly Economic Report and its Spanish version, Informe económico trimestral. 26. Carmelo Mesa-Lago, “The Economic Effects on Cuba of the Downfall of Socialism in the USSR and Eastern Europe,” in Mesa- Lago, editor, Cuba After the Cold War (Pittsburgh: University of Pittsburgh Press, 1993), p. 138. 27. For full information on the sources of these data see Jorge F. Pérez-López, The Economics of Cuban Sugar (Pittsburgh: University of Pittsburgh Press, 1991), pp. 140-141. 28. Carmelo Mesa-Lago and Fernando Gil, “Soviet Economic Relations with Cuba,” in Eusebio Mujal-León, editor, The USSR and Latin America: A Developing Relationship (Boston: Unwin Hyman, Inc., 1989), p. 201. 29. Pérez-López, “Cuba’s Transition to Market-Based Energy Prices,” p. 22. 30. See Jorge F. Pérez-López, “Cuban Oil Reexports: Significance and Prospects,” The Energy Journal 8 (1987) and Pérez-López, “Cuba’s Transition to Market-Based Energy Prices,” p. 27. 31. For further elaboration on this subject see Jorge F. Pérez-López, “Swimming Against the Tide: Implications for Cuba of Soviet and Eastern European Reforms in Foreign Relations,” Journal of Interamerican Studies and World Affairs 33:2 (Summer 1991), pp. 98-100. 32. Ernesto Meléndez Bachs, “Relaciones económicas de Cuba con el CAME,” América Latina (Moscow), no. 7 (1987), pp. 95-96. 33. José Luis Rodríguez, “Las relaciones económicas entre Cuba y los países socialistas: Situación actual y perspectivas,” mimeo (1989). 34. A. Bekarevich, “Cuba y el CAME: El camino de la integración,” in Academia de Ciencias de la URSS, Cuba: 25 años de construcción del socialismo (Moscú: Redacción Ciencias Sociales Contemporáneas, 1986), p. 98. 35. For a description of the law and the investment climate in the 1980s see Jorge F. Pérez-López, The 1982 Cuban Joint Venture Law: Context, Assessment and Prospects (Coral Gables: North-South Center, University of Miami, July 1985). 36. The discussion on hard currency debt draws heavily from A.R.M. Ritter, “Cuba’s convertible currency debt problem,” CEPAL Review 36 (December 1988). 37. This information originates from various issues of the Banco Nacional de Cuba, Quarterly Economic Report. It should be noted that some of the year to year fluctuation in the value of the debt is a function of changes in the exchange rates between the U.S. dollar and other hard currencies. 38. Carlos Rafael Rodríguez, “Discurso pronunciado en la sesión XLV del CAME, Sofía, Bulgaria, 9 de enero de 1990,” Granma (10 January 1990), p. 4. 39. The two addresses were published for mass distribution under the title Independientes hasta siempre. See Fidel Castro, Independientes hasta siempre: Discursos de inauguración y en el acto de masas, IV Congreso del Partido Comunista de Cuba, Santiago de Cuba, 10 y 14 de octubre de 1991 (La Habana: Editora Política, 1991). 40. Castro, Independientes hasta siempre, p. 67. 41. Castro, Independientes hasta siempre, p. 69. 43. Sergio Roca, “Reflections on Economic Policy: Cuba’s Food Program,” in Pérez-López, editor, Cuba at a Crossroads: Politics and Economics After the Fourth Party Congress, pp. 94-117. Lage is cited on p. 94. 44. Carmelo Mesa-Lago, Are Economic Reforms Propelling Cuba to the Market? (Coral Gables: North-South Center, University of Miami, 1994), p. 24. 45. For descriptions and/or analysis of reform measures in the 1990s see, e.g., Mesa-Lago, Are Economic Reforms Propelling Cuba to the Market?, especially pp. 13-56; Bert Hoffmann, editor, Cuba: Apertura y reforma económica (Caracas: Editorial Nueva Sociedad, 1995); Jorge Pérez-López, “Cuba’s Socialist Economy Toward the Mid-1990s,” The Journal of Communist Studies and Transition Politics 11:5 (June 1995); Rubén Berríos, “Cuba’s Economic Restructuring, 1990-1995,” Communist Economies & Economic Transformation 9:1 (1997); and Omar Everleny Pérez Villanueva, “Cuba’s Economic Reforms: An Overview,” in Jorge Pérez-López and Matías Travieso- Díaz, editors, Perspectives on Cuban Economic Reforms (Tempe: Center for Latin American Studies Press, Arizona State University, 1998). 46. “Decreto-Ley No. 140,” Gaceta Oficial (August 13, 1993) and “Informa Banco Nacional de Cuba sobre uso de las monedas libremente convertibles,” Trabajadores (August 15, 1993). 47. Larry Rohter, “Cuba Allowing Citizens to Buy and Sell Foreign Currencies,” The New York Times (November 9, 1995), p. 3A; and “Casas de cambio aumentan compra de dólares,” El Nuevo Herald (November 28, 1995), p. 1B. 48. “New Convertible Peso Announced,” Havana Radio Reloj Network (December 20, 1994), as reproduced in FBIS-LAT-94-245 (December 21, 1994), p. 5. 49. On changes to the 1982 foreign investment law in the area of property rights see Jorge F. Pérez-López, “Islands of Capitalism in an Ocean of Socialism: Joint Ventures in Cuba’s Development Strategy,” in Pérez-López, editor, Cuba at a Crossroads, pp. 193-4. 50. “Ley No. 76—Ley de Minas,” Gaceta Oficial (January 23, 1995). 51. “Ley No. 77—Ley de Inversión Extranjera,” Gaceta Oficial (September 6, 1995). 52. “Decreto-ley No. 165—Ley sobre Zonas Francas y Parques Industriales” (3 June 1996), www.prensa-latina.org. 53. Ministerio para la Inversión Extranjera y la Colaboración Económica, “Resolución No. 66/96—Sobre el Registro Oficial de Concesionarios y Operadores de Zona Franca” (24 October 1996), www.tips.cu; and Aduana General de la República, “Resolución No. 34/ 96—Sobre el Régimen Especial Aduanero en las Zonas Francas y Parques Industriales” (18 October 1996), www.tips.cu. 54. This section relies heavily on Yosem E. Companys, “Institution-Building: Financial Sector Reform in Cuba,” in Cuba in Transition—Volume 7 (Washington: Association for the Study of the Cuban Economy, 1997), pp. 430-444. 55. “Central Bank of Cuba established,” Granma International Electronic Edition, no. 25 (1977). 56. The State Committee on Technical-Material Supply was abolished by the reorganization of government functions of April 1994. See “Decreto-Ley No. 47—De la Reorganización de los Organismos de la Administración del Estado,” Gaceta Oficial (21 April 1994). 57. “Call to the 5th Congress of the Communist Party of Cuba,” Granma International Electronic Edition, no. 16 (April 1997). 58. “The Party of unity, democracy and the human rights we defend,” Granma International Electronic Edition, no. 21 (June 1997). 59. The speech, which lasted more than 6 hours, was reportedly delivered extemporaneously by Castro, who chose not to present a written report, as had been done in the first three Party Congresses. According to observers, Castro had not delivered an extemporaneous speech of such length since the 1960s. See Pablo Alfonso, “Castro habla 6 horas al inaugurar congreso,” El Nuevo Herald (9 October 1997), p. 6A. The text of the central report, as issued by the Cuban government, appears, e.g., as “Informe Central al V Congreso del Partido Comunista de Cuba, presentado por el Comandante en Jefe Fidel Castro Ruz, Primer Secretario del Comité Central del Partido Comunista de Cuba y Presidente de los Consejos de Estado y de Ministros, en el Palacio de las Convenciones, el día 8 de octubre de 1997,” Granma International Edición Digital, no. 43 (November 1997). 60. “Discurso Pronunciado por el Comandante en Jefe Fidel Castro Ruz, Primer Secretario del Comité Central del Partido Comunista de Cuba y Presidente de los Consejos de Estado y de Ministros, en la Clausura del V Congreso del Partido Comunista de Cuba, efectuada en el Palacio de las Convenciones, el día 10 de octubre de 1997,” Granma International Edición Digital, no. 43 (November 1997). 61. “Discurso … en la Clausura del V Congreso del Partido Comunista de Cuba,” Granma International Edición Digital, no. 43 (November 1997). 62. Although the statistics for the three years for which there is overlap in the two sources of data are not identical, they are sufficiently close to justify their use to assess the performance of the external sector during the 1990s. 63. Cuba: Informe económico, año 1997, p. 4. 64. Central Intelligence Agency, Cuba: Handbook of Trade Statistics, 1997, APLA 97-10006 (Washington: Central Intelligence Agency, November 1997) and earlier issues. 65. Reportedly, exports to the Netherlands were for reexport through the Rotterdam spot market. 66. Cuba: Informe económico, año 1997, p. 5. 67. Cuba: Informe económico, año 1997, p. 5. 68. Charles Suddaby, “Cuba’s Tourism Industry,” in Cuba in Transition—Volume 7 (Washington: Association for the Study of the Cuban Economy, 1997), p. 129. 69. María Dolores Espino, “Tourism in Cuba: A Development Strategy for the 1990s?,” in Pérez-López, editor, Cuba at a Crossroads, pp. 158-159. 70. Francoise L. Simon, “Tourism Development and Transition Economies: The Cuba Case,” Columbia Journal of World Business 30:1 (Spring 1995), p. 30. 71. Espino, “Tourism in Cuba: A Development Strategy for the 1990s?,” p. 159, based on studies conducted by the Cuban Ministry of Tourism. 72. Simon, “Tourism in Transition Economies: The Cuba Case,” p. 30. 73. As an example of the difficulties in dealing with statistical information on Cuba, a news item carried in El Nuevo Herald in January 1998 based on a Spanish news agency EFE report from La Habana cites a story published in Granma in which an official of the Ministry of Tourism states that gross tourism revenues in 1997 were $850 million when 1,171,000 foreign tourists visited the island. The same official predicts that revenue from tourism will exceed $1 billion in 1998, when 1.4 million tourists are expected to visit the island. While the statistics on the number of visitors does match the series in Table 12 and in a recent report by the Ministry of the Economy and Planning cited above, the revenue figures do not, putting into question whether they refer to the same concept, i.e., gross revenue v. net revenue, or whether the series include or exclude certain expenditures such as aviation and telecommunications costs. See “Turismo reportó ingresos de $850 millones en 1997,“ El Nuevo Herald (7 January 1998), p. 6A. 74. International Monetary Fund, Balance of Payments Manual, Fourth Edition (Washington: International Monetary Fund, 1977), p. 71. 75. Banco Nacional de Cuba, Economic Report 1994, p. 21. 76. Banco Nacional de Cuba, Informe económico 1995, p. 23. 77. CEPAL, La economía cubana: Reformas estructurales y desempeño en los noventa, p. 172. 78. BOP statistics (Table 6) show net transfers of $532 million in 1995; this means that sizable outgoing transfers must have occurred in this year to offset the estimated $600 million in private transfers. 79. Sergio Díaz-Briquets, “Emigrant Remittances in the Cuban Economy: Their Significance During and After the Castro Regime,” in Cuba in Transition—Volume 5 (Washington: Association for the Study of the Cuban Economy, 1995), pp. 218-227. 80. David Orrio, “Tran$card: ‘mulas’ y disidencias,” www.cubanet.org (June 21, 1998) and “Tarjeta de crédito para enviar dólares,” El Nuevo Herald Digital (June 24, 1998). 81. CEPAL, La economía cubana: Reformas estructurales y desempeño en los noventa, p. 123. 82. Cuba: Informe económico, año 1997, p. 5. 83. “Carlos Lage Comments on Economy,” Havana Tele Rebelde and Cuba Vision (November 7, 1992), as reproduced in FBIS-LAT- 92-219 (November 12, 1992), p. 9. 84. Cited in Business International Corporation, Developing Business Strategies for Cuba (New York: Business International Corporation, 1992), p. 24. 85. “Carlos Lage Addresses Conference 21 November,” Havana Tele Rebelde Network (November 23, 1994), as reproduced in FBISLAT- 94-229-S (November 29, 1994). 86. “Support for Economic Changes,” Havana Radio Havana Cuba (July 12, 1995), as reproduced in FBIS-LAT-95-137 (July 18, 1995). 87. For further elaboration see, e.g., Jorge F. Pérez-López, “Foreign Investment in Socialist Cuba: Significance and Prospects,” Studies in Comparative International Development 31:4 (Winter 1996/97); Pérez-López, Odd Couples: Joint Ventures Between Foreign Capitalists and Cuban Socialists, North-South Agenda Paper No. 16 (Coral Gables: North-South Center, University of Miami, November 1995); Maria C. Werlau, “Foreign Investment in Cuba: The Limits of Commercial Engagement,” in Cuba in Transition—Volume 6 (Washington: Association for the Study of the Cuban Economy, 1996); and Werlau, “Update on Foreign Investment in Cuba: 1996-97,” in Cuba in Transition—Volume 7 (Washington: Association for the Study of the Cuban Economy, 1997). 88. The objective of USTEC, an organization created in the United States in 1994, is to “provide an efficient and sustainable educational structure in which the United States business community may access accurate, consistent and timely information and analysis on matters and issues of interest regarding Unites States-Republic of Cuba commercial, economic, and political relations.” See “About the U.S.-Cuba Trade and Economic Council,” www.cubatrade.org. 89. Christopher Marquis, “Two Firms Face Helms-Burton Sanctions,” The Miami Herald (January 22, 1997). The companies include Canada’s Sherritt, Israel’s Group BM and a Panamanian company selling automobiles in Cuba. Mexico’s Grupo Domos and CEMEX reportedly withdrew from Cuba before being formally warned. 90. “Helms-Burton Law Said to Benefit Tourist Trade,” Havana Prensa Latina (June 24, 1996), as reproduced in FBIS-LAT-96-126 (June 18, 1996), p. 4. 91. “Foreign Investment Minister on Helms-Burton Law,” El País (Madrid) (June 15, 1996), as reproduced in FBIS-LAT-96-119 (June 19, 1996), pp. 2-3. 92. Pablo Alfonso, “Lage: Ley tiene ‘efectos negativos’ en Cuba,” El Nuevo Herald (July 24, 1996), p. 1B. 93. Juan O. Tamayo, “‘Antídoto’ contra la Ley Helms intenta socavar presión de Estados Unidos,” El Nuevo Herald (January 2, 1997), pp. 1B, 2B. 94. “Hay empresas de 40 países en la isla, dice Ministro,” El Nuevo Herald (October 17, 1997), p. 6A. 95. Cuba: Informe económico, año 1997, p. 6. 96. Werlau, “Update on Foreign Investment in Cuba: 1996-97,” p. 83. 97. “Cuba ‘no se siente presionada’ para solucionar deuda externa,” El Nuevo Herald (October 26, 1997), p. 6A. 98. According to a report by the Russian press agency ITAR-TASS issued in May 1998, Cuba was Russia’s largest debtor, responsible for $18.3 billion or 15.2 percent of the overall debt of $120.2 billion owed to Russia. “Cuba es el principal deudor,” El Nuevo Herald (May 26, 1998), p. 6A. 99. “Lage pide optimismo y confianza en el futuro,” El Nuevo Herald (December 27, 1997), p. 4A. 100. Andrew Cawthorne, “Una economía de corcho sobre un mar de desastres,” El Nuevo Herald Digital (June 15, 1998).